How to clean cloudy glass? The answer begins with an understanding of the root cause behind most glass clouding: Usually a scratch-causing combination of water, detergent and you. The dishwasher can create problems for your glasses than it's use solves. Let's start with the water. It is usually softened to make soaps clean better. And dishwasher water is heated to 140 degrees to further increase its cleaning power. Then there's the dishwashing detergent. It's packed with phosphates to boost cleaning power. And then there is you and me - the user who dutifully rinse dishes before loading them into the dishwasher. The combination packs an almost too-powerful cleaning punch that often leaves glasses looking worse for wear. These 3 tips can help clarify the problem and provide solutions to clean cloudy glass. When the dishwasher runs, things get hot inside. 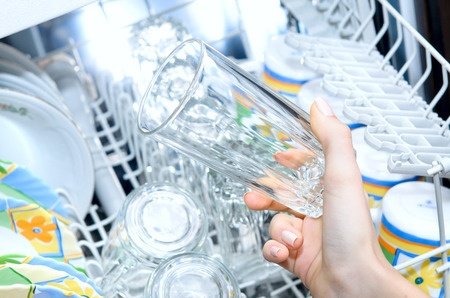 Without hard-water minerals to act on, and little food waste to occupy them, the cleaning phosphates in your dishwashing detergent turn into troublemakers for glassware. At the end of the cycle - or combination of months of cycles - you up with foggy glasses that no amount of cleaning seems to coax away. A magnifying glass, however, would reveal the truth - your glasses aren't the least bit dirty or fogged with a film. In fact, they're so clean as to be etched - as in the surface is scratched. To determine whether you're dealing with simple water stains on glasses, hard water deposits, or etching, drop a bit of vinegar onto the glass. Rub it around with your finger. Drain the vinegar; let dry. If the rubbed area dries clear, it's a film - and you can clean these water stains off your glasses easily. If there's no change, however, your glassware has been irreversibly etched and the damage is permanent. The most common culprit for water stains on glasses is hard-water drops of calcium and magnesium repeatedly drying into place on glasses in the dishwasher, and not using enough dishwasher detergent. 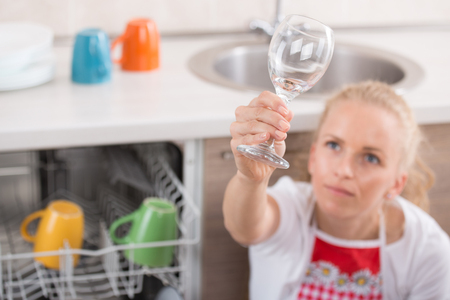 To remove hard water stains from glasses, add an acidic rinse (such as white vinegar) to your dishwasher and run the cycle again with the the glasses inside. Be sure to check your dishwasher's instructions for the right amount detergent to use. Cleaning glasses with vinegar by hand is probably the best way to clean them. The best performing low phosphate detergents include Finish Powerball Tabs, Cascade Complete All-in-1 Actionpacs, and Cascade Complete All-in-1 Gel Dishwasher Detergent with Bleach Hydroclean Action. You can also give Restaurant Crystal Clean: Professional Wine Glass Cleaner and Crystal Cleaning Liquid a try; it works wonders on removing glass clouding and reducing soap scum - no soaking required. Increasing the temperature of the water entering the dishwasher to 140 degrees F.
Using the no-heat, energy-saver dry cycle. Adjusting the amount of dishwashing detergent you use according to the hardness of the water. Letting the detergent do its job unaided: Refrain from pre-rinsing dishes before putting them in the dishwasher. This not only saves water, it gives your detergent what it needs to be effective: Food to remove. Without it, the alkaline concentration of your detergent increases, which is bad news for your glasses.